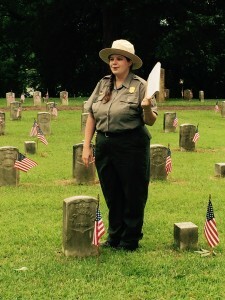 U. S. Park Ranger explains that this is the true grave of the boy honored by the song, Memorial Day 2015. Yesterday, I had the opportunity to visit the Shiloh National Cemetery located on the Shiloh Battlefield within our national park. Our ranger took us to the grave of the young boy commemorated in a rare piece of sheet music which we hold in Library Special Collections. 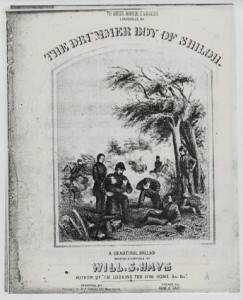 The title is “The Drummer Boy of Shiloh.” She told us that immediately following the Civil War, another boy was mistakenly named as the soldier about whom the song had been written and he did not correct the general public, but instead enjoyed the publicity. The lyrics tell that the drummer boy died on the battlefield. 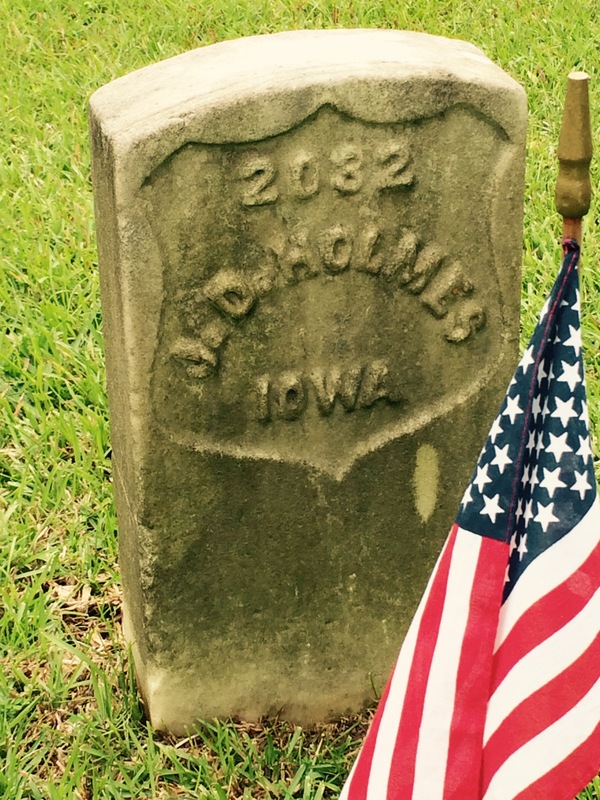 Later, historians researching Shiloh identified J. D. Holmes to be its true soldier hero. 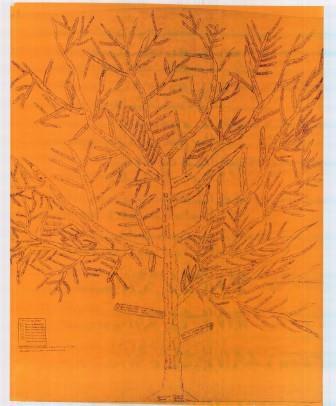 WKU’s Library Special Collections has over one hundred war songs in its 4228 pieces of sheet music. In our collection of Civil War ballads, WKU has nine titles by Will S. Hays of Louisville, Kentucky, including “The Drummer Boy of Shiloh.” Although a Unionist who was publishing titles like “The Union forever, for me!” and “Sherman and his gallant boys in blue” through a Louisville publishing house during the Civil War, Hays wrote many lyrics between 1861 and 1865 which stirred the heart strings of Yankees and Rebels. A good example is “I am dying, Mother, dying.” During the two day battle of Shiloh, Tennessee, more Americans died in combat than the total of all wars to that date. It was the first of many Civil War battles with unthinkable numbers of casualties. “On Shiloh’s dark and bloody ground, The dead and wounded lay; Amongst them was a drummer boy, Who beat the drum that day. A wounded soldier held him up His drum was by his side; He clasp’d his hands, then rais’d his eyes, And prayed before he died. Look down upon the battle field, ‘Oh, Thou our Heavenly Friend! Have mercy on our sinful souls!’ The soldier’s cried ‘Amen!’ For gathered ’round a little group, Each brave man knelt and cried; They listened to the drummer boy, Who prayed before he died. ‘Oh, mother,” said the dying boy, ‘Look down from heavn on me, Receive me to thy fond embrace — Oh, take me home to thee. I’ve loved my country as my God; To serve them both I’ve tried.’ He smiled, shook hands — death seized the boy Who prayed before he died. 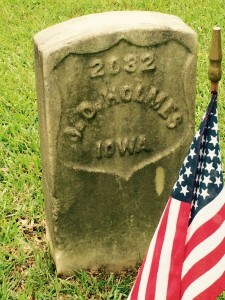 Kentuckian Will S. Hays wrote numerous Civil War songs. Ye angels ’round the Throne of Grace, Look down upon the braves, Who fought and died on Shiloh’s plain, Now slumb’ring in their graves! How many homes made desolate — How many hearts have sighed — How many, like that drummer boy Who prayer before they died! 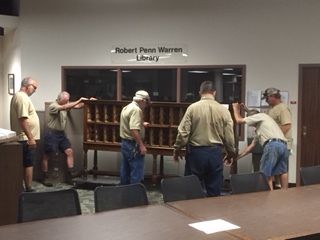 Special Collections are often referred to as hidden collections. They require a special environment, careful handling and labor intensive description work to make them available. In the time it takes to process a small collection of photographs I suspect a book cataloger could catalog about 250 books. 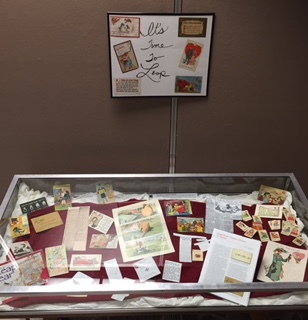 WKU’s Special Collections are over 75 years old and we are just now beginning to gain ground in opening our hidden collections with the help computer technology. KenCat is your portal into our world of special collections. Since purchasing this software in 2005 we have created descriptions of over 56,000 items housed in the Kentucky Building. 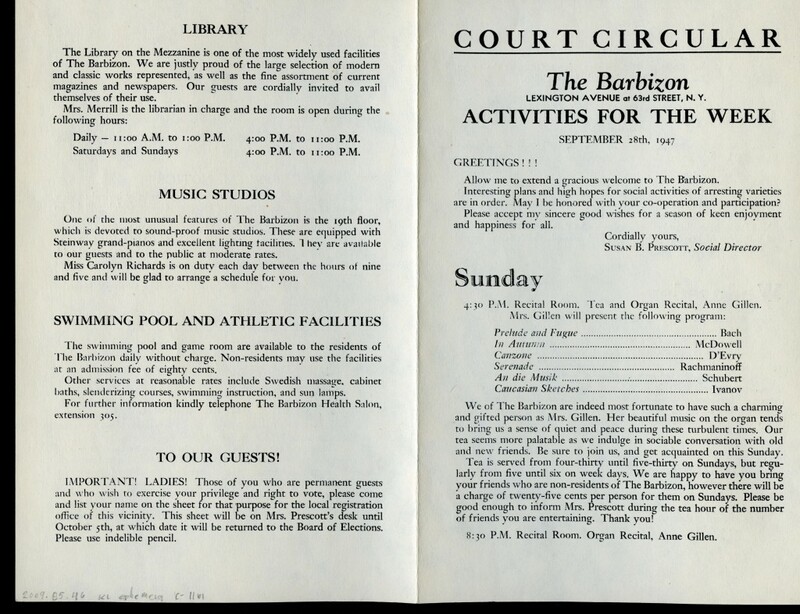 There are rare books on all sorts of topics, books about Kentucky, maps, photographs, documents, oral histories, blueprints, postcards, newspapers, memorabilia, letters, diaries and much more. KenCat went live late in 2007 and searches have been steadily increasing since that first year from 2 to 21,566 so far this year. We will continue to reveal more and more of our treasures in the years to come.